Wii Sports Resort has 380,781 players reporting their play-time data this week. Wii Fit Plus has 184,417 players reporting their data. New Super Mario Bros. Wii has 393,960 players reporting data this week. Wii Sports Resort had an increase of 10,235 more players reporting play-time data this week, over last week. 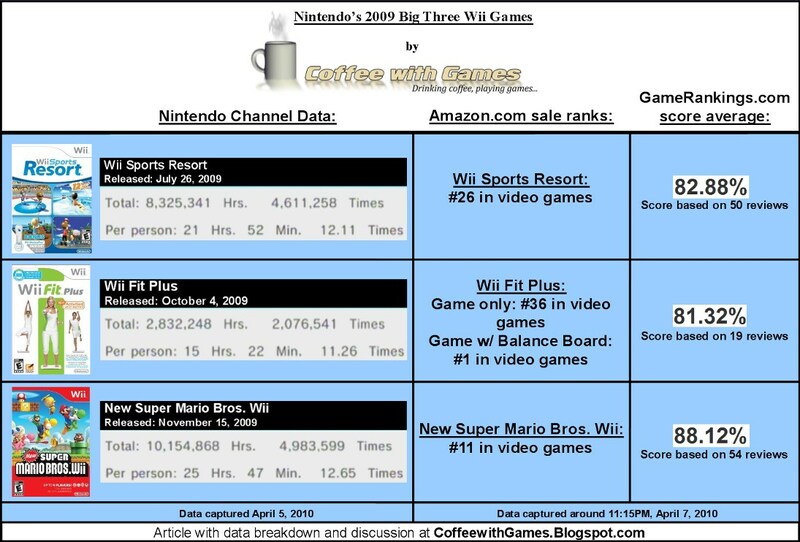 Wii Fit Plus had an increase of 6,765 more players reporting play-time data. New Super Mario Bros. Wii had an increase of 16,106 more players reporting their data. Wii Sports Resort has 8,325,341 Total Hours reported, an increase of 323,026 hours from last week. Wii Fit Plus has 2,832,248 Total Hours reported, an increase of 158,186 hours from last week's data. New Super Mario Bros. Wii has 10,154,868 Total Hours reported, an increase of 670,377 hours from last week. Wii Sports Resort 's Amazon.com sale rank is #26 and the current selling price is $46.99. Wii Fit Plus ', the game only, Amazon.com sale rank is #36 and the current selling price is $16.46. Wii Fit Plus w/ Balance Board 's Amazon.com sale rank is #1 and the current starting new price is $99.99. New Super Mario Bros. Wii 's Amazon.com sale rank is #11 and the current starting new price is $41.23. Wii Sports Resort's review score average is 82.88%, based on 50 reviews. Wii Fit Plus' review score average is 81.32%, based on 19 reviews. New Super Mario Bros. Wii's review score average is 88.12%, based on 54 reviews. Well, Amazon.com has Wii Fit Plus w/ Balance Board back in stock! Not only is Wii Fit Plus w/ Balance Board back in stock, but it's also sitting at the #1 spot, making it currently the most sold video game on Amazon.com. Amazon.com had gone 12-weeks without the bundle in stock, and just yesterday when I checked they had it in stock, and again tonight! Do you know anybody that's been looking for Wii Fit Plus w/ Balance Board, but hasn't purchased it due to them not being able to find it? Do you think Amazon.com will run out of stock again of Wii Fit Plus w/ Balance Board, or do you think people may have given up looking for it, and Amazon.com will now be able to meet demand? I'll be watching the status of it on Amazon.com, and I really wonder how long it will stay in stock, and I wonder if Nintendo lost a lot of customers since January, because they weren't able to find the bundle.